Despite that within the soundtrack, we find only positive Christmas compositions (like Rockin' Around The Christmas Tree by Brenda Lee), the film itself is absolutely not the one you want to watch with the whole family on the eve of the approaching holiday. Firstly, it's a horror. Secondly, we don’t meet here the charming fat guy Santa, which will bring us many gifts. On the contrary, there will be a big unattractive character named Krampus. Krampus is anti-Santa (his companion) and according to Germanic mythology is the one who punishes the children who have not behaved properly throughout the year, in contrast to the good Mr. Claus, who gives gifts. Krampus can take the children to the Hell, drown them, or kill in any other way. He is portrayed as a kind of something with hooves, horns and dark hair, and represents the image of the Goat, which is known to be associated with Satan, in the most common of his guises. 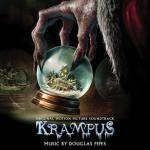 He is evil, brings torment and suffering and antagonistic to Santa (in the film, not Santa Claus Is Comin' To Town by Bing Crosby, but his dark compatriot – Krampus). And that is true – there must be an evil, if good exists.